I am trying to better balance motherhood and working full-time outside the home. My hubby carries so much of the load, with being the first one home from work and just being his wonderful self, that I wanted to figure out how to help. Enter my crockpot. I have been scouring for recipes that will work for the family and my weight watchers diet. 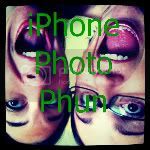 Recently I did a crockpot recipe search on pinterest and found this website. And decided to try this recipe for Sue’s birthday dinner. Brown meet with spices in a frying pan, drain fat, stir in pasta sauce, simmer for a few minutes (don’t rinse or throw away pasta sauce jar). 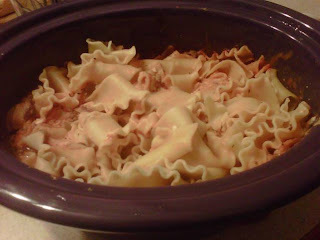 Put some meat mixture on the bottom of your crockpot, then a layer of noodles (they will have to be broken up to fit in), then a layer of cottage cheese, mushrooms, and a layer of cheese, repeat. The original recipe calls for adding fun veggies, broccoli, spinach, etc., but I forgot or didn’t have them on hand. Cook in crockpot for 4.5-5 hours on high. About 30 minutes before it is done, cook up a few extra noodles on the stove, layer those on top of lasagna at the end of cooking to tie it all together. It makes a lot. About 8 servings, and comes out to 10-11 weight watchers points plus per serving. I liked it, hubby liked it (has been taking the leftovers to work) and the babies even liked it! It is higher in points values than I normally eat for dinner, but I budgeted through the day so I could have some for my sweet girls’ birthday dinner. They are, after all, why I am working so hard on my health; my weight, my exercise and my cholesterol. I want them to grow up knowing good choices are a natural part of life. That exercise is something to plan, look forward to and enjoy. I am looking forward to those results for myself, but as I watch my girls, I get drive to continue when I might quit otherwise. But, I am going to take a bit of Alicia’s advice, and remember, the laundry, dirty dishes, messy rooms, will always be there, so I will take the time I need right now to exercise and make wise eating choices. *Weight watchers update, I lost another 1.2 lbs, for a 3 week total of 4.8 lbs. My sweet baby Patrice seems to be struggling a little bit the last couple days. She is a bit fussier than normal, which is to say, she is actually fussy. She is typically a very happy, content baby. Yesterday daycare reported she was hard to console all morning. Tonight she is also grumpy. Turns out daycare had another tough day with my sweet-ums. My guess is teeth. I don’t see any but she is nursing different. She is clamping down more and kind of grinding her mouth. Just seems she is looking for something to be more comfortable. It is not a lot of fun for her or mama. I feel so bad for her. She is normally so happy. It makes me wonder how much discomfort she is really in. I am guessing a fair amount. If she is going to do this like her sisters, we will be seemingly on a non-stop teeth spree soon. My girls wait a little while to get them but once they start, they come one right after another. Ahhhhh….I must admit, I am dreading it a little bit. 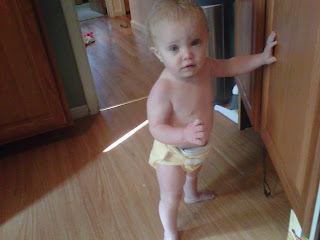 I am dreading the fussiness, the diaper rashes and the interrupted sleep. I also dread teaching her not to bite me while nursing. But while it is something I will have to teach her, it is not impossible. She will learn. And likely learn pretty quickly. My older two did. My brilliant midwife taught me the trick before even the first attempt. Don’t pull baby away, even though that is reflex, it just adds pain. Rather, push baby toward me so her little nose gets tapped. It makes her open her mouth in a little gasp and stops any clamping down of that little jaw. It works like a charm. And it works for me this Wednesday. I am hopelessly in Love with this hubby of mine and daddy of theirs. Nothing touches my heart more than to see him displaying his deep love for his girls. Today he showed that by spending extra time outside playing with them. He is hopelessly in love with his girls and that works for me on this snowy Wednesday. Works for Me Wednesday has a fun Valentine’s Day theme this week. Hop on over and enjoy! This also worked for Things I Love Thursday. I did the math one day when Caitlyn was a baby and each baby wipe I used, even when I bought them on sale was 2 cents EACH!!!!!!!!!!!!! Now, I will admit, this was not for the cheapest ones. I had tried those and they smelled so bad I couldn’t stand using them. Horrible smell. But I hated the 2 cents each price. You can use a lot of those in just one diaper change. Then a friend told me how she made her own wipes, they smelled nice and were much cheaper. So we started making ours. Three kids later and we are still making them. This mix makes enough for ONE of the short rolls, you’ll have to make the “juice” twice to make up both rolls. Combine all in sauce pan, bring to a boil, stir often. Boil about 3 minutes until all ingredients are dissolved, you will have clumps of lotion if you don’t boil the mix long enough. Place paper towel roll in the pan, let some of the moisture soak in, then put the roll in your storage container (a tall canister shaped bowl with a lid works great), pour any remaining liquid over the roll. Put lid on tightly. The steam will finish getting the roll wet. Now repeat with 2nd roll of paper towel. Remove the paper towel cardboard center when the wipes cool enough to touch. When you are all done you have wipes for a week or more. Now head on over to We Are That Family to see what is working for others! 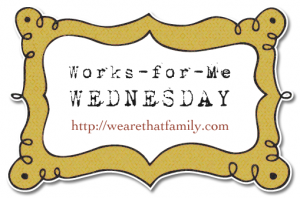 This week’s What Works for Me Wednesday is a bit different, the theme is What Does Not Work for Me! Mornings do not always work for me. I don’t mind being up, but I do mind trying to find my kids clothes, socks and shoes. Shoes, how I loathe thee! But we have been very diligent so far, 3 days, with putting out clothes for the kids and I the night before. That helps a lot. Much less stress for the whole family. Also, making lunches in the morning does not work for me. It doesn’t work for my hubby either, so he has been making them the night before. My hubby makes an amazing sandwhich. I am not sure what the secret is, but they are so yummy. Being clocked in the head by my daughter does not work for me either. Sue was pushing Caitlyn who for some reason was holding her camera above her head; before I had a chance to control that situation, Caitlyn wacked me on the head with her new camera. Ugghhh. Her rotten apology doesn’t work for me either. She yelled at me “Sorry, I didn’t mean it.” For the record, she did not sound sorry. So after I dealt with Sue’s behavior, Caitlyn and I had a chat about how we apologize for hurting someone, EVEN if it is an accident. For the record, my head still hurts, the pain has outlasted the kidlets consequences. Ahhh, the joys of motherhood. Going cold turkey off all candy is not working for me either. Hubby and I have started eating healthier this week and I am struggling with the junk cravings. I’m trying to keep them in check, but oh, the struggle!!!! And I refuse to give up my nightly chocolate milk. The baby needs me to get calcium, right? I guess, right now, there are a few things that do not work for me!!! I hope you enjoyed these thoughts and will check out what is not working for others. We are starting to get the question, “when is it going to be Christmas? When is it going to be Christmas?” So I hunted up an advent calendar someone had given us. It’s cute, but it is all about the Santa and fantasy aspects of Christmas. Not really my goal for an advent calendar. 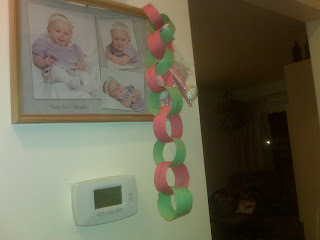 I remembered reading over at MckMama’s blog where she made a pair chain for her kids when counting down to her youngest’ birth. And that sounded like a good idea. I decided to do something like that for my girls. Yesterday I sat down and for the first time in decades. I made a paper link chain. Then I got to thinking about the Bible reading I have been doing. A few of us on twitter have started reading a Proverb a day along with reading Luke at our own pace (you can follow along #SONlight). A thought came. To marry the two. Each night we are taking one link off and reading the reference. There are a lot more you could use, but those were some verses I selected. Maybe this will get us started on a family devotion of some sort. Now I am going to head over to We Are That Family and see what works for other people.